Advertising industry magazine Campaign have this morning reported that they’ve got hold of 3 videos that were deemed too controversial and edgy to release. 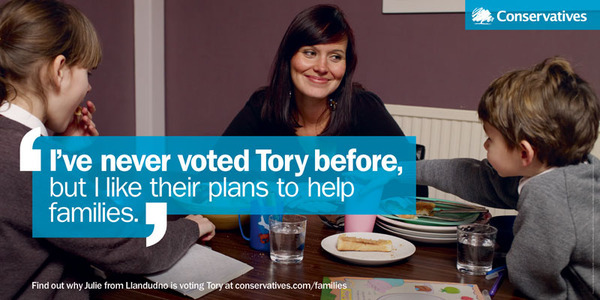 The videos were, apparently, made to support the ‘I’ve never voted Tory before, but…’ series of posters. The videos were sent to Campaign incognito and Euro RSCG, the agency who created the controversial spots, have subsequently threatened legal action if they are released. I have heard previously that were a number of adverts that had been pulled and have since been desperately trying to get my hands on them. Now that they’ve been anonymously sent to Campaign it can’t be long before they’re uploaded to video sharing sites… How exciting. Saw it in the Times [the whole ‘coming out as a conservative’ etc] – but have you found any links to the videos yet?